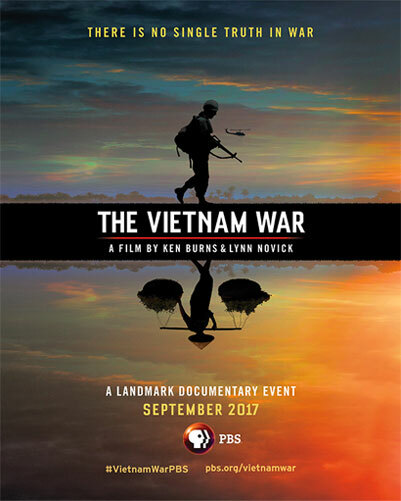 Ken Burns and Lynn Novick's ten-part, 18-hour documentary series, The Vietnam War, tells the epic story of one of the most consequential, divisive, and controversial events in American history as it has never before been told on film. The series explores the human dimensions of the war through revelatory testimony of nearly 80 witnesses from all sides — Americans who fought in the war and others who opposed it, as well as combatants and civilians from North and South Vietnam. Ten years in the making, the series includes rarely seen, digitally re-mastered archival footage from sources around the globe, photographs taken by some of the most celebrated photojournalists of the 20th Century, historic television broadcasts, evocative home movies, and secret audio recordings from inside the Kennedy, Johnson and Nixon administrations. The Vietnam War also features more than 100 iconic musical recordings from greatest artists of the era. The Vietnam War will premiere September 17, 2017 on WHRO TV15 at 8pm ET. The first 5 episodes will air nightly from Sunday, September 17, through Thursday, September 21 and the final five episodes will air nightly from Sunday, September 24, through Thursday, September 28. Each episode will premiere at 8:00 p.m. ET with a repeat broadcast immediately following the premiere. Beginning Tuesday, October 3, the series will re-air on a weekly basis through November 28, at 9:00 p.m. ET. On September 17, concurrent with the broadcast premiere, the first 5 episodes of THE VIETNAM WAR will be available for streaming on all digital platforms, including WHRO.org, PBS.org, WHRO and PBS apps on iOS, Android, Roku, Apple TV, Amazon Fire and Chromecast, and the final 5 episodes will be available beginning September 24. All episodes will remain accessible until October 3, when the series begins its weekly rebroadcast. During the rebroadcast period, each episode will be available to stream for two weeks. WHRO Passport members can view the entire series starting September 17. This series will also be available in Spanish and Vietnamese on streaming.